Press Printing for photographers from Marathon provides photographers with a cost-effective solution for producing high-quality photography marketing materials and press printed photography products.Marathon's Press Prints for photographers is perfect for those who want the convenience of placing their press printing order online any time of the day or night and don’t require the experience of Marathon’s account executives or photographic designers. Create your own press print designs or use Marathon’s exclusive, professionally designed photographer templates at no additional charge. Best of all, photographic press print orders can be placed online anytime at your convenience through Marathon ROES. 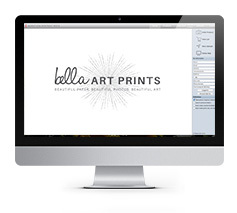 Simply choose a press printed product, select a size, upload or create your photography press print design online and complete your press printing order. It’s that easy. Plus all standard shipping and handling is absolutely free within the continental United States! Press Printed Folded Cards are scored at no additional charge for easy folding and shipped flat. If you prefer to have them folded, the following rates will apply. Please contact Customer Service at 800/228.0629 for more information. Press Printed Brochures are scored at no additional charge for easy folding and shipped flat. If you prefer to have them folded, the following rates will apply. Please contact Customer Service at 800/228.0629 for more information.